It is also our concern to impart our clients a profound understanding of the complex social structure of this deserving protection area. The establishing of mobile bushcamps was the start of our history. For more than eight years we have been able to welcome our guests at Matira Bush Camp , the best location in the heart of the Maasai Mara. It is also a concern of ours to live up to the standards of undisturbed nature and ecological management. Matira Bush Camp is styled in harmony with nature midst of one of Africa’s most dramatic wildlife: captivating adventures on gamedrive, enchanting voices of the savannah at night-time and the „African Magic Feeling“ even after sunset. Our team is composed entirely of Maasai members who grew up locally. Their knowledge oft he native flora and fauna and their culture creates charming inputs , unforgettable moments and guarantees safety in the wilderness. 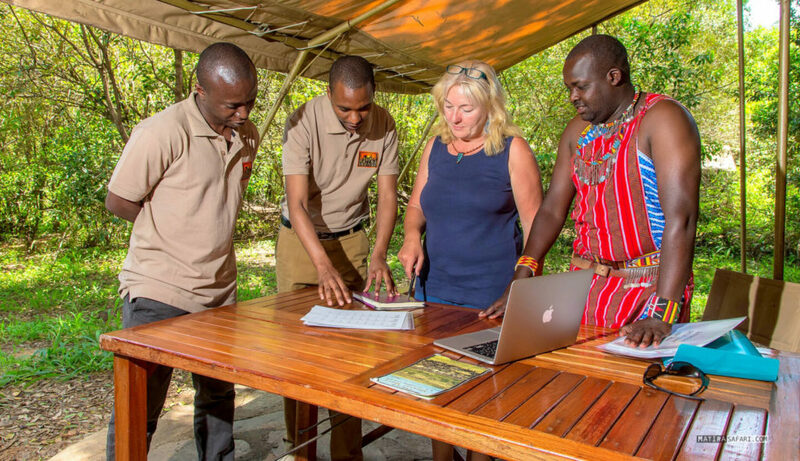 Antony and his crew can look back on long years of experience as safari guides, camp builders and caretakers of customer from around the world. The combination of the cordial manner of the Maasai with international management flair preserves Matira’s family charm. Based on our experience we take care of more and more customers on their tailormade safari and wildlife trip. Matira cooperates for years with the „Peregrine Fund, conserving birds of prey“ esp. Vultures. These amazing animals are an important part of a thousands of years old ecosystem and remind us of our responsibility as „guest“ of wilderness. the „Enkiteng Lepa“ all-day school in Tepeshua, we are committing ourselves to individual local needs. Education and water supply is topic. If you would like to experience „real nature, wildlife and culture“ in an individual way, you feel very comfortable with us – we are looking forward for sharing adventures with you.